Bell Let’s Talk Day is today. Canadians across the country can participate by talking, texting and joining on social media on January 30th. Every year, the national carrier hosts a campaign dedicated to mental health awareness and fundraising as a way to encourage Canadians to send messages and engage in conversation about mental health in order to help reduce stigma and raise money. To be part of the conversation, use the hashtag #BellLetsTalk on Twitter, watch the Bell Let’s Talk videos on Facebook, Instagram, or uses the special Snapchat filter. 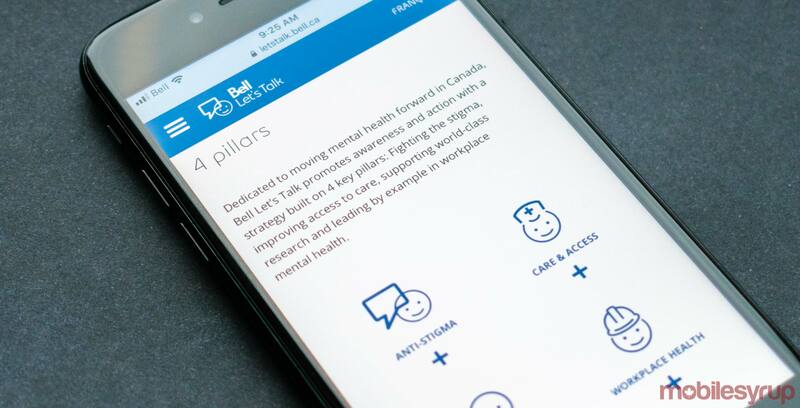 If you’re a Bell subscriber the carrier donates five cents to Canadian mental health providers every time you makes a long distance call or send a text. There are also various events taking place across the country. Bell Let’s Talk ambassador Bruno Guévremont is in Halifax at various events throughout the day. In Toronto, Hot Docs and Workman Arts will have a special free screening of the documentary Robin Williams: Come Inside My Mind. Williams committed suicide in 2014 after a prolonged fight with depression. There’s a Toronto Raptors 905 game to support the cause, Bell Let’s Talk ambassadors Chris Johnson, Étienne Boulay, Jonathan Thériault and Richard Langlois, Len Reynen, and Michel Mpambara will be across the country at various events. There were also events leading up to today as well. In Ottawa on Parliament Hill, there was a Mental Health event with Senators and Members of Parliament to discuss how they can support mental health. Québécois singer and songwriter Stefie Shock performed at the Bell Media studios in Montreal. Guévremont spoke with employees of the Nova Scotia Office of Workplace Mental Health and at the Nova Scotia Community College Ivany Campus. He also visited the Canadian Mental Health Association employees in Halifax. Bell Let’s Talk ambassador Beth Beattie, who is also a senior counsel at the Ontario Attorney General’s office, spoke to 700 students in Toronto. Bell Let’s Talk ambassador Shreya Patel was in Mississauga, Ontario to participate in a mental health panel with employees of Intuit Canada. Last year the campaign hit a record high with over 138 million interactions and an investment of $6.8 million CAD.